Many of us have something in common – we desperately want to serve our families healthy homemade meals. But we’re often being stretched in so many ways it’s hard to find the time to do so. With good intentions we buy those healthy foods only to run out of time when the supper hour nears. With hungry mouths to feed we give up & grab a quick drive-through meal instead. The result is significantly more expensive and also less healthy than a home-cooked meal would be. But whaddya do?? This dinnertime rush was a common problem for me too, years ago. But things changed for me when I discovered the “Cook Once Eat Twice” method of cooking. The idea is simple – cook LOTS of a specific main entree and enjoy it for the meal that day. Then portion out & freeze the rest for quick meals later. It’s been a game-changer for me. Filling The Oven With Meatloaf! Here’s an example – recently I decided I was really in the mood for Wild-Game Savory Meatloaf. It’s one of my favorite meat dishes made with lean ground pork from the wild hogs RancherMan harvests. I can fit four loaf pans in my oven at the same time so I mixed up the meatloaf & filled the oven to capacity. In making my meatloaves I was able to use up several pounds of meat from the freezer and turn it into delicious meals for both now & later. RancherMan & I enjoyed the meatloaf for supper that night and of course I had to put a few servings in the fridge so he could enjoy meatloaf sandwiches. But the rest was sectioned up into meal-sized servings, each serving placed in a repurposed plastic bag. (have I mentioned lately how much I HATE plastic bags & make sure to reuse them at least once before recycling or throwing away??). Each of these meal-sized bags of meatloaf are then placed in a zippered freezer bag for freezer protection. And of course a label is inserted inside the freezer bag to identify the contents. I can pull out a dinner serving of meatloaf and either use it as meatloaf or crumble it for the meat in spaghetti, tacos, etc. How versatile! The real beauty of this method of cooking is that all those food-preparation dishes like knives, spoons, cutting boards, mixing bowls, etc were only dirtied once. Plus the oven was only fired up once saving both energy and time. Yet we have about 10 meals worth of meatloaf waiting in the freezer for us to enjoy over the next several weeks. I use this same procedure with other main entrees such as pork roast, stuffed bell peppers, homemade ravioli, etc. Now that I have all those different homemade entrees in the freezer, making dinner will be a snap. When I’m planning supper for the next day I check out the contents of my main-entree drawer in my freezer to see what’s already cooked for us to enjoy. I’ll decide what sounds good, pull out the main entree I’m planning for the following day’s meal and place it in the fridge to thaw overnight. The next day when I’m preparing supper I simply heat the main entree, add a couple of vegetable sides or even make a whole pan of Roasted Veggies and voila – homemade in minutes! I’m also able to save quite a bit of money by using food I’ve already purchased. And the meals are homemade so they’re significantly more healthy than commercially-prepared foods. I also use the Planned Leftovers method of cooking to streamline our meal prep. For instance, I’ll cook a huge Pork Roast and enjoy roast & potatoes for supper. Then I’ll use this Homestead Hack to quickly Shred Leftover Roast to make brand new dishes such as Pulled Pork BBQ, or maybe Carnitas Tacos, or even Pulled-Pork Enchiladas. One large roast initially cooked but several different dishes are now a snap! How do you streamline the dreaded rushed supper hour? Want to see other Leftover Pork Roast Meal Ideas? 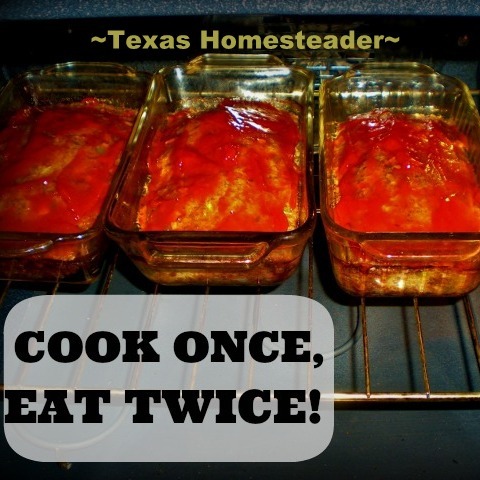 This entry was posted in Blog Posts and tagged Cooking, Environment, Frugality, Make-It-Yourself on March 16, 2014 by Texas Homesteader. Pingback: Month-Long No-Sugar Challenge: WEEK TWO! This is great, we do something similar where we usually make double of items we can use in other recipes. Whenever I make mashed potatoes or rice, I always make double. This way I have the base for a sheppards pie, fried rice, rice pudding, you name it. I also love finding cool ways to turn leftovers into new meals, like turning boiled dinner into corned beef hash. By the way, you totally have me craving meatloaf sandwhiches. I totally need to make meatloaf now. Thanks for the menu item for next week! It’s a vicious, but delicious, cycle! While I love the idea of Once A Month Freezer Cooking, I never seem to find the time to accomplish that task. Instead, I have found that the Cook Once, Eat Twice method has worked wonders for me. Thanks for sharing! I love the cook once eat twice (or three or four times) method of cooking. When I make spaghetti sauce or soups I use this all the time! We store most of our leftovers in large yogurt containers, since our daughter eats so much we have lots of containers left over. Thanks again for linking up with Idea Box! Yes, I try and do this too! Great tip! We also like to make a large batch of coleslaw or green salad to last the week (or at least part) for the side dishes. Looks so yummy! I need to do more of this. Best wishes! Pingback: MYO Healthy Chicken Broth - EASILY! Great tip and something I should start doing. Thanks for sharing it on Merry Monday Linky Party. What a great idea! I have to admit that I don’t plan dinners very well so I need to try this! Great tips!! Cooking for a large family I love to keep things simple! Thanks for sharing at the HomeAcre hop! This is such a great idea. I’ve been using the crock pot a lot lately since it always feels like theres so much going on when its time to make dinner, it kind of bumps all the cooking work to earlier in the day. But this, this is BRILLIANT! If I only had to cook dinner every other day, think of all the time I’d have….Thanks for sharing. I have been doing this for years as well. i need to have a big cooking weekend soon because Spring is here and this is our busiest time of the year! Thanks for sharing at TTF. Brilliant idea! And really brilliant to cut the peppers in half!!! I never considered that and just stuff whole ones. SO COOL!!!!! THANK YOU!! I try to do this as well. Sometimes I am better at remembering to do it than others. I did do it tonight. I made enough calzones for 3 meals plus I fried up hamburger for even another meal. The work done ahead does really feel good. What a great idea – I gotta start doing this!